We fetched our daughter today at the airport I was thinking whether to continue the 16:8 protocol even for today. Driving to and from the airport sometimes stresses me, which in turn, makes me hungry. Anyway, I just brought something to feed me, just in case I get a headache while driving. It's just my third day of this 16:8 Intermittent Fasting and I'm still getting used to it. I'm glad I brought something to eat because it struck noon (my fast ends at 12 noon) while I was still driving. So I was able to munch while in traffic. The reason I'm having the 16:8 Intermittent Fasting protocol on weekends is because my kids are around on these days. I'm happier if I'm able to join them at both lunch and dinner. Like today, after fetching our daughter, DH said she wanted to try the restaurants at the famed Maginhawa street in Diliman. We've never eaten there before as a family so it may be a good time to try. And try we did. With my daughter's Waze function in her phone, I drove through many side streets in the area. Being on a Sunday, many of the restaurants were busy with customers. Finally, we ended up in a small Chinese restaurant named Pakibalot Panciteria along Maginhawa Street. Pakibalot means "To go" although, literally, it means "Wrap". Panciteria means "Noodle House". I'm not sure if Pakibalot meant customers always ordered to "dine-out" rather than "dine-in", or maybe many customers had doggy bags after dining. Nonetheless, DH, ordered a lot of food for us and everything was was sooooo goooodd! This is one instance why I contemplate on the One Meal a Day (OMAD) fast for Mondays. And it's because of weekend eat-outs, especially Sundays. Because of the pigging-out, I'm inclined to have a lengthier fast on either Monday or Tuesday. My One-Meal-A-Day or OMAD protocol is like a 23:1 ratio of fasting:feeding. This is where I eat (or feed) for an hour like 7 pm to 8 pm at dinner, and then fast for 23 hours. The next meal would be dinner at the same time next day. 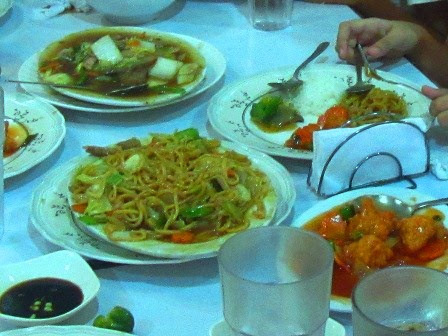 Here's what we had: Mixed veggies, which looks like Chopsuey to me, Canton Guisado (my favorite) and Sweet and Sour chicken. Somehow the chicken tasted like Orange chicken, but I'm not complaining. And then came the final entree, Crispy Pata. Crispy Pata is deep fried pig trotters or knuckles served with a soy-vinegar dip. What else do you do when you're full and Crispy Pata is served? Eat some more! That's the Crispy Pata that DH is digging into at the far end of the table. By the time we were done, we still had some Crispy Pata leftovers and had that doggy-bagged. After that heavy lunch, the girls were still thinking of desserts. So they bought some ice cream at a nearby shopping area. It's a good think I'm not into sweets, or else that's another issue I have to contend with as far as health is concerned - sugar.